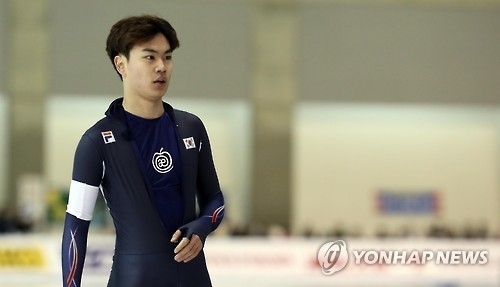 OBIHIRO, Japan, Feb. 23 (Yonhap) -- Speed skater Kim Min-seok won the men's 1,500-meter title for his second gold medal at the Asian Winter Games in Obihiro, Japan, on Thursday. Kim finished his race in 1:46.26 at Obihiro Forest Speed Skating Rink, some 200 kilometers east of the main host city, Sapporo. Takuro Oda of Japan got the silver medal, half a second behind the South Korean. Taro Kondo, another Japanese, earned the bronze in 1:47.88. Kim, 17, earlier won the team pursuit gold medal with Lee Seung-hoon and Joo Hyong-jun on Wednesday. This was South Korea's fifth speed skating title at these Asian Games, with the men's and women's mass start races remaining Thursday, the final day of speed skating.